Warning: Lots of Photos. Little Content. 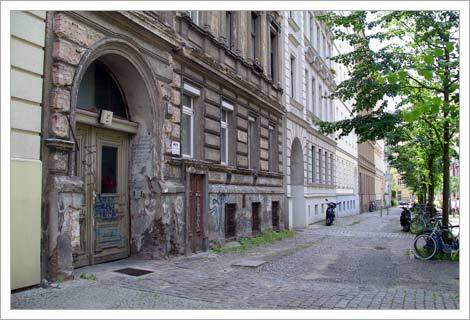 Greetings from Prenzlauer Berg, former German Democratic Republic (AKA East Berlin), in all it's falling apart/rebirthing glory. In a word, this 'hood is awesome. I love how every other building threatens to fall on your head, while the neighboring one has been so completely renovated as to look brand new. After yoga this afternoon, I decided to get my yarn shop browsing out of the way. First stop: Loops, which is just up the way from the apartment I'm renting. Loops has a really great selection of GGH and Lana Grossa among others, too many other things. 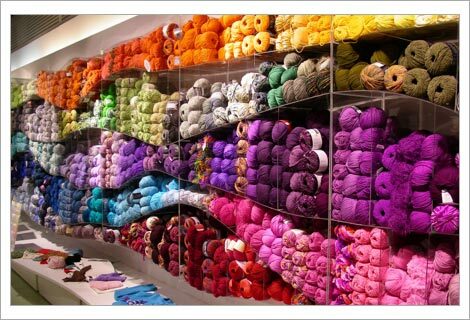 I spent about half an hour deciding on sock wool. 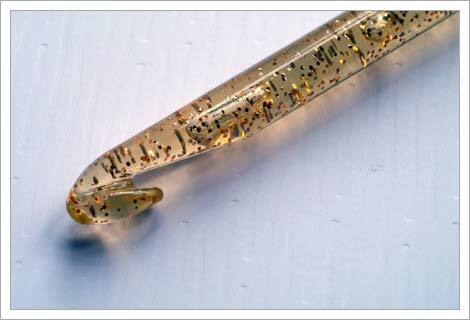 If you ever see the Regia Tweed (at least that's what I think it's called) around, grab it. It's super soft and would make great sitting-by-the-fire Winter socks. I may go back and get some. 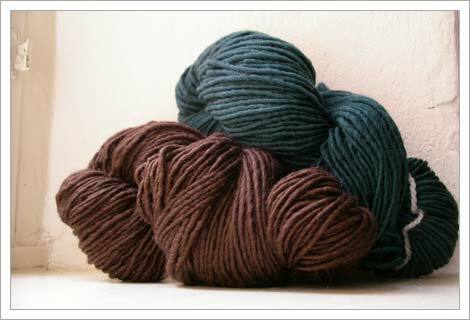 I ended up with three skeins of Lang Jawoll, which I will eventually use to practice stranded knitting. 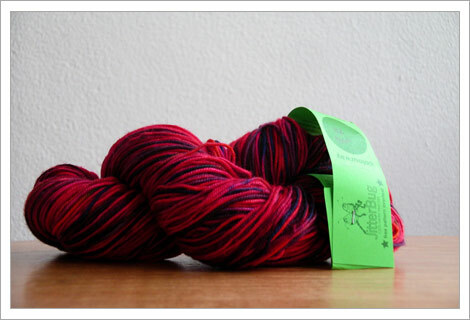 And then there's the mystery yarn. All I know is that it's produced in small quantities somewhere in Germany, and that it's made form lamb's wool and regular wool. I'm going to knit B a scarf with this. Eventually. I also went out to the KaDeWe, the up market German department store chain. Their Berlin store has the distinction of being the Continent's biggest one. I'm not sure it beats the main Galeries Lafayette in Paris*, but that's what my guidebook said. 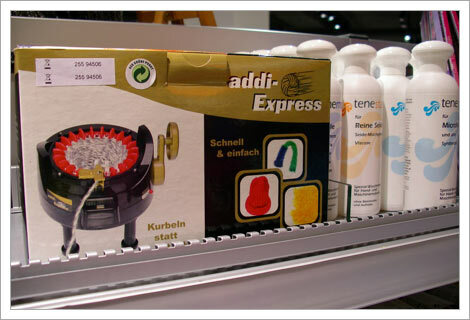 KaDeWe has a separate annex devoted to craftsy endeavors from scrapbooking to sewing to painting to knitting and needlework. 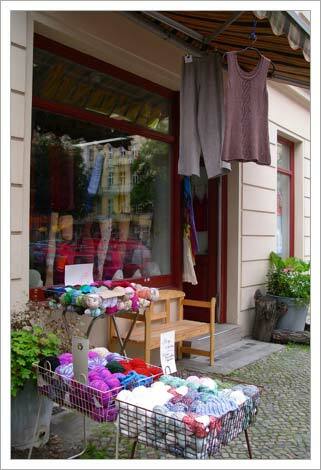 They mainly carry Lana Grossa, Rowan, Gedifra, and Schachenmayr Nomotta, which by the way has some nice stuff. I only bought some wool wash and a Regia sock pattern brochure. It's in German. I'll figure it out somehow. And then... then... I made my way back to the main building to the "gourmet foods" floor. While not as impressive as Harrod's in London, the KaDeWe's food floor is pretty nice. 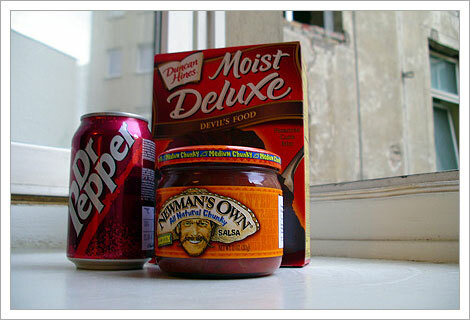 They have regular supermarket items mixed with fancy pants gourmet. Then there is the section of American condiments, complete with American flags and mini Statues of Liberty. I very nearly cried right there in the store when I saw the Dr. Pepper. I occasionally feel homesick for the U.S., but this really hit me. Growing up in Texas, you don't live if you don't drink Dr. Pepper. I bought the Devil's Food cake mix b/c I've recently been jonsing for it; I'm pretty sure it's because of these. The salsa is because I usually eat burritos once a week and I'm self-catering. Oh and just in case you were wondering, the socks are progressing very, very slowly. These were shot with the camera in my lap, set to go off with the timer. That's the view of the crumply ole building I'm staying in. I assure you it's quite cute on the inside. 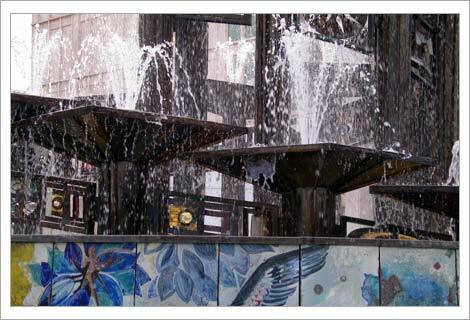 I leave you for now with this shot of the the fountain at Alexanderplatz. * BTW, there is a Galeries Lafayette here. Guide Book says that they import baguette dough from Paris every morning. Dude, could you pass up such opulence? My little trip up to Leiden (a mere 15 minutes by train) was a roaring success. My main goal was to pop into Ribbels, to pick up some yarn for the Ogee Lace Skirt and to get some advice on the yardage for B's sweater. Christa, the owner, came through on all fronts. Ribbels, by the way, must be on the cutest street in the whole town. Her shop neighbors include a handmade felted hat shop, a lingerie/funky purse shop, as well as several cute handmade jewelry dealers. 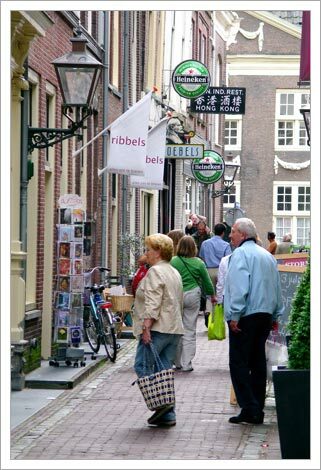 And seriously, I think Leiden has the best concentration of independent shops in the whole country. I love going up there and wandering around. First up, B's sweater. Christa's assessment was that 18 50g balls should be plenty for a men's medium. Her prescription was to go home and knit it until I finish or find myself in danger of running out of yarn. She doesn't think it'll be a problem tracking down the dye lot. So, I have no excuse not to work on it. In fact, I need to make some serious progress before I go home. Secondly, I picked up 7 luscious balls of Rowan Bamboo Tape in the Wode colorway. Now this is funky stuff, like nothing I've ever knitted with. The "yarn" is more like super soft ribbon. It almost looks like it is already knitted into this shape. But it is really, really, really nice and AND 100% bamboo. 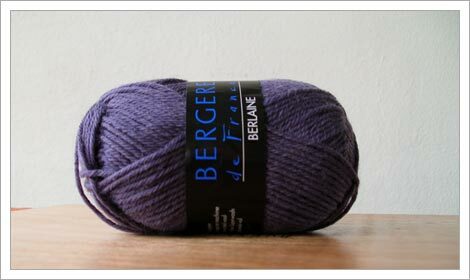 I plan to start on Ogee in Berlin, as a respite from sock knitting. I was so enamored with the Bamboo Tape that I picked up Rowan's Bamboo Tape Collection book/leaflet thingie, which features simple, Japanese-inspired tops. 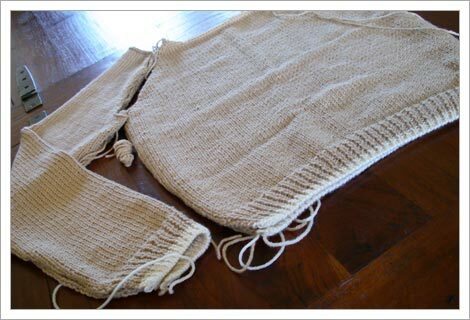 I'm pretty keen to knit this shrug, also to wear over my yoga clothes. This'll be a Fall project. The Summer is full. 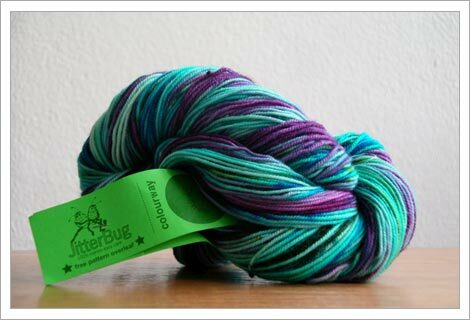 And naturally I couldn't leave without sniffing out the sock yarn, particularly her stock of Colinette Jitterbug. Just because. It's called Gaugin. Could you resist? Not to worry, I am not joining the crochet bandwagon just yet, although I'm still jonsing for an afghan. The Ogee has some crochet edging. Guess I need to relearn chain stitch (dunno if that's even what it's called). It's been awhile since I was 9 and crocheted pot holders for my grandma. Note to regular readers: if you aren't in my blog group, you might want to skip over this post. No knitting here. 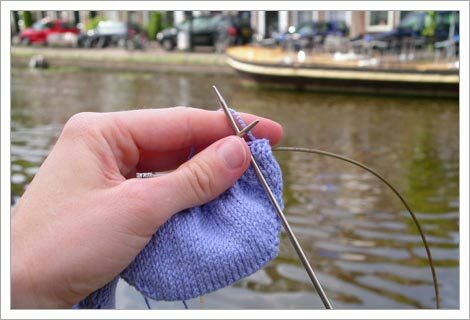 I promise I'll write a knitting-related post later today. It's today! It starts today! Can you feel that breeze in the air? 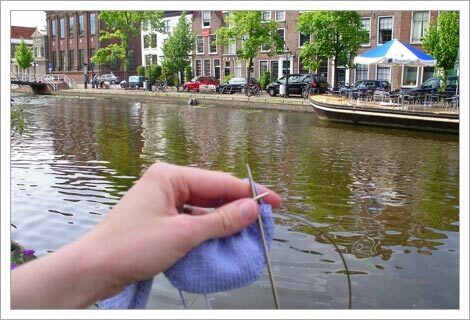 That's 506 sock knitters around the world casting on. Don't forget it's the Summer Solstice (in the Northern Hemisphere anyway), so it's also a good time to do a barefoot dance in the yard. If you're into that kind of thing. If you haven't emailed yet, please do. I need to add you to my contacts so I can keep you informed of important Summer of Socks goings-ons, but also so I can be sure that my SPAM filter isn't snagging your emails. 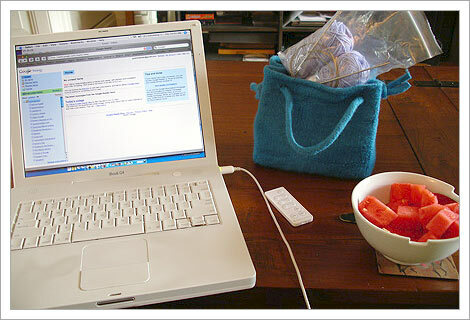 My SOS 07 email address is: knittingsutra AT gmail DOT com. I've subscribed to all but three of your blogs. Those three don't have their feeds turned on. I'll try very hard to keep track of the feedless three, and all of you really, but you should get in the habit of emailing whenever you post about Summer of Socks. As I've mentioned to those that have my welcome message, I'm dealing with a slew of people with the same or similar names. I'll be challenged to keep track of who's who. Especially this first week when I imagine there will be a flurry of sock activity, can you send me your blog posts as soon as you publish them rather than send me a list of links Friday afternoon? I don't want to send my report to Beth on Friday night and not highlight your mad sock skillz. Don't worry, if I miss you one week, you'll be at the top of my list the following week. I think that's it for now. Remember Ya'll: Sock Speed! 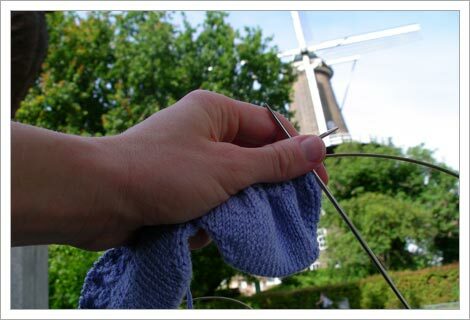 If you're like me, you have this impression that the sleeves of a sweater will take no time. 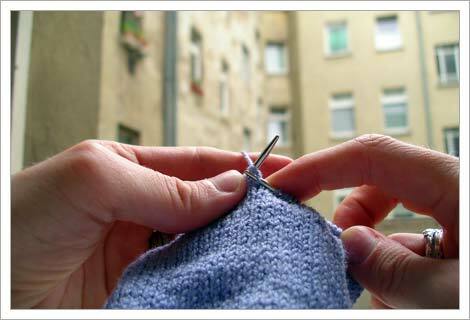 Once I get to the sleeves, I think to myself and sometimes even tell B, "Hey, I'm almost done! I just have the sleeves" I mean, they're narrower right? Yet, these sleeves seem to be taking ages, so I thought I'd do some math and see if it's true that finishing the front and back actually mean's you're almost done. Looks like I'm right, only barely. They're very nearly the same, but knitting the front and the back does mean that you're half way through a long-sleeve sweater. Of course I'm not counting finishing. I'm half way through Jemima's second sleeve. I'm crossing my fingers that I'll start the finishing tomorrow. I did something "funny" on the front panel, which I was able to fix without frogging back a few inches. I was hoping that any residual wonkiness would go away after blocking, but it's still there. So, here's a question for you: How do you block your projects? I used to steam mine with an iron, but lately I've been pretending to wash them - you know get them completely wet, shape them on some towels, pin them in place, then let dry. But it occurred to me, do I have to block the sweater every time I wash it? So, should I also steam my projects? Will that "set" them somehow? You'll recall that back in May, Ali encouraged us to draw up our summer knitting goals. Since it's been about a month I thought I'd take a look at my progress so far and make a few revisions. Knit at least one pair of socks per month for Socktopia and Summer of Socks 2007. It's not looking good for June since I'm waiting to cast on tomorrow. I'm not confident that I'll manage a pair in a week, but stranger things have happened. Start and finish no-wool socks for my mom. Starting this week. 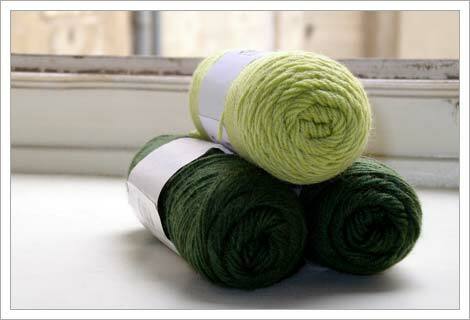 Find a project for the umpteen skeins of Debbie Bliss Cashmerino 501 that were a sweater. I have some thoughts, including Wicked. Think about whether Decide if I can will actually knit the Hanami Stole for my mother-in-law or for my mom or both for Christmas. 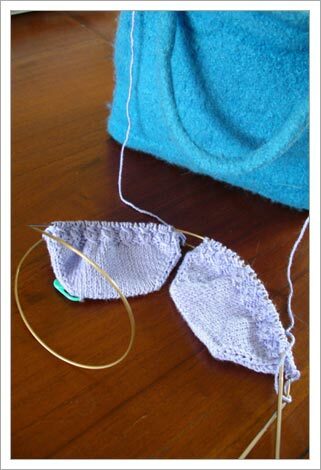 I need to find out if my mother-in-law would like such a thing, and if I like lace knitting. I've added a lace wrap skirt (see #12 below) as a test run. Make three peace cranes (one for me, two for friends). Make the Ogee Lace Skirt from Interweave Knits, Summer 2007 to wear over yoga pants. Summer of Socks 2007 shenanigans start on Thursday, and I'm ready. 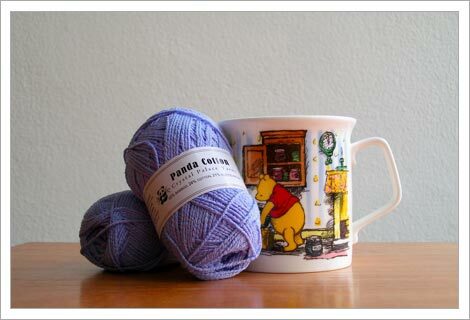 I spent some time over the past couple of evenings getting to know the Panda Cotton better. It's very different from wool -- the texture of individual stitches really pops out -- and I had some trouble figuring out a pattern that wouldn't compete with the fiber. 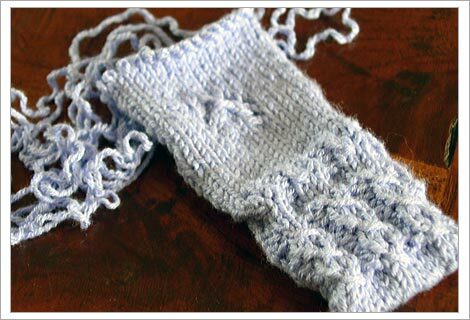 I worked this one inch tube of material, trying out about half a dozen stitch patterns before I decided on one. I wanted something a little lacy for Mom because she's a girly girl and lives in hot, humid Texas. On the other hand, I didn't want anything too fussy that might mess with the fit. All sock yarn is off the needles, and I'm ready to cast on 11am my time on Thursday. 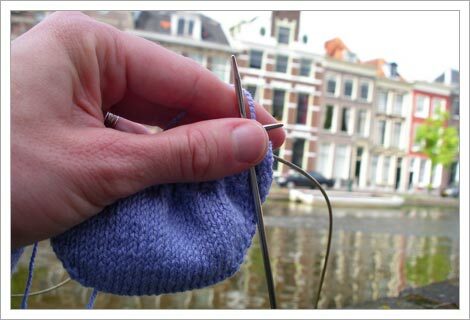 There are a handful of contests that run the entire three months of the event including a competition for the most socks knit, socks on vacation photo contest and a prize for best sock pattern design. 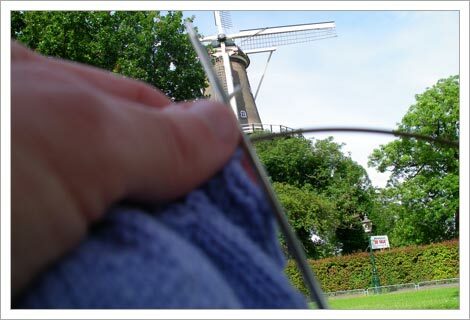 I have no chance at winning any speed knitting or sock design contests, but we have some interesting trips up our sleeves before we leave Europe. My real goal for SOS is to make a dent in the sock yarn stash I picked up last March. 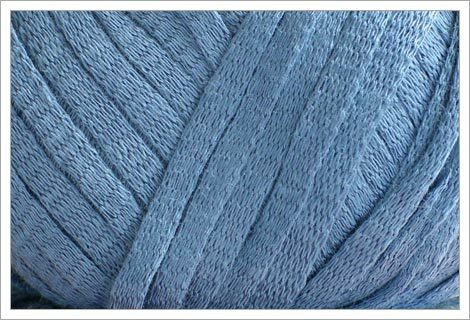 I'm particularly interested in working through the cotton and bamboo - you know... summery fibers. I'm thinking that if I work through my stash, I'll feel far less guilty about the inevitable binge I'll go on at Knit Happens when I go back to DC. Watch out, ladies, I'm comin'!